We are a reputed manufacturer of Electrical Control Panel of all kinds. We manufacture MCCs, PCC, PDBs, Control Panels, PLC Panels, Mimic Panel, SPM Panels. 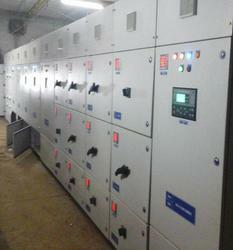 We are an experienced, professional and most importantly a reliable manufacturer,of Electrical Control Panels. We are a ISO 9000-2008 compliant Panel Engineering Shop and our products have complied to Quality Standards like CPRI, CE, ULetc. Our products have been working succussfully over decades throughout India, in Perth, Australia, in Zibmabwe, in Ghana, in Mozambique, in Thiland, in Crotia, in USA and many other countries. We offer premium quality LT Control Panel manufactured to meet the stringent international quality standards. Our panels are used for controlling and monitoring the mains supply from a centralized location using protective switch gears. Our LT Control Panel is also used for distributing boards on a small power control near to the load center.